The chateau de Colombières dates from the end of the 14th century. It is a medieval fortress flanked of towers and surrounded by a moat full of water. 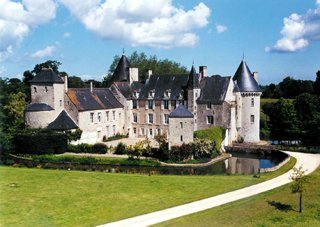 Bordered by the marsh of the Baie d'Isigny, the castle stands in a charming landscape that makes dream becoming reality. Generation after generation, this familial residence has received the best attention of its owners. The Count Etienne de Maupeou will be happy to welcome you there. Bed and breakfasts from the 1st of April to the 30th of October.